On March 5, 1496, in the wake of the tremendous news about the voyage of Christopher Columbus to the New World, King Henry VII of England granted “letters patent” to John Cabot, an Italian sailor and adventurer, along with his sons, to explore the world on behalf of the English Crown. As Columbus was an Italian (Genoese) working for the King and Queen of Spain, so too was Cabot, an Italian originally from The Kingdom of Naples, employed by a foreign power. Cabot became (probably) the first European since perhaps the Vikings in the 11th Century to visit North America, giving England their entry into the settlement of North America by a European country. 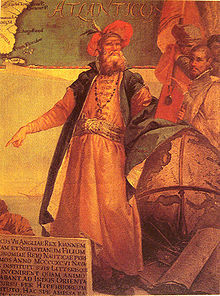 Born Giovanni Caboto (in Italian), we remember this exploring legend by his Anglicized name, John Cabot. While on business in Venice, Italy, Cabot is known to have used the Venetian form of his name, Zuan Chabotto. As if not confusing enough, Cabot’s Italian banker in London referred to him as Giovanni Chabbote. His exact birthplace on or about 1450 is unknown, possibly in the Province of Genoa, or maybe in the Province of Latina (more likely). One of Cabot’s sons later claimed John Cabot had originally hailed from Genoa, and other contemporaneous sources also refer to him as “Genoese like Columbus.” Still not sure? Cabot was made a citizen of Venice in 1476, a status that required at least 15 years residence at that time, implying that Cabot had lived in Venice at least from 1461 to 1476. Probably from a family of at least some social standing, Cabot is believed to have entered the maritime trading business soon after being granted Venetian citizenship in 1476. Records indicate he was already married with 2 sons by 1484 (he had a total of 3 sons, Ludovico, Sebastian, and Sancto), and might have been involved in the construction business in Venice. Financial problems led to Cabot seeking work in Spain, moving to Valencia (the author has been there, and the city is beautiful!) ahead of his creditors in 1488. The next few years found Cabot unsuccessfully attempting various construction projects, and by 1494 he was seeking sponsorship to mount an expedition to the New World. Failing to find funding in Seville and Lisbon, Cabot traveled to London, England in 1495 in search of a sponsor. Cabot was given an audience with King Henry VII, arranged by a fellow Italian, a Papal Tax Collector. 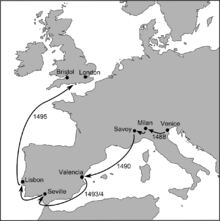 Cabot’s travels around Europe, 1488–95, following his escape from Venice. Map by Evan T Jones. Route of 1497 voyage posited by Jones and Condon. Map by Evan T Jones. In 1498, Cabot set sail with new letters of patent and a fleet of 5 ships, this time packed with trade items for trading with Native Americans. One of the ships only made it as far as Ireland and Cabot forged ahead with the other 4 ships. What happened next is unknown to history, with the possibility that Cabot and his ships were lost at sea, either on the way to North America or on the return. A tantalizing bit of information is that a sailor known to have been on the expedition is recorded as having been in London in 1501, and some recent historical investigation has concluded that Cabot and/or at least some of his men did make it back to England in 1500, but the evidence seems inconclusive to others. The reports from the first successful voyage of John Cabot on behalf of England inspired other English expeditions to North America and ultimately resulted in the colonization of Canada and what is now the United States by British settlements, resulting in the 2 great countries that occupy the Northern portion of North America today. For this achievement, we thank John Cabot, whatever his real name and fate is! Square Cabot, Montreal. Photograph by Andrevruas. Questions for Students (and others): What do you think happened to Cabot and his last expedition? Did you know of Cabot’s role in exploring North America? Burgan, Michael. The Story of North America’s First Explorers. Capstone Press, 2016. Garfield, Henry. The Lost Voyage of John Cabot. Atheneum Books, 2010. Pope, Peter. The Many Landfalls of John Cabot. University of Toronto Press, 1997. Seelye, James, and Shawn Shelby, Editors. Shaping North America [3 volumes]: From Exploration to the American Revolution. ABC-CLIO, 2018. The featured image in this article, a Newfoundland Postage stamp, 1897 issue, obtained from eBay (eBay item I320594637410), is in the public domain.